It's never too late to educate yourself on how to rank high for a keyword in the search engines. It doesn't have to be overwhelming if you start out slowly and follow a plan. Just like most things, you'll get better and faster the more you do the work. Where you rank in the search results, can mean the difference between no traffic and steady traffic. The key is to focus on the keywords that you can potentially rank well for and to continue to produce high-quality content that meets the needs of your target audience. Before I give you my simple guide for how to rank high for a keyword, please note the following about SEO (search engine optimization). SEO is an ongoing part of website maintenance and should be measured and tracked. SEO is a fluid process and your rankings can change even if you are not updating your content. SEO is impacted by things out of your control, like Google changing their algorithms and other websites competing for the same keywords as you. SEO is best done by you or someone that has a very good knowledge and understanding of your business and your target audience. SEO is not a short game so don't be fooled by someone claiming to be able to get you to the top of any search results page. Now, here are my instructions for how you can perform your own keyword research for free. Before you start your keyword research, you'll want to make sure you have your website added to both the Google Search Console and Google Analytics. Both of these tools are very useful in giving you actionable information that you can use to drive and measure your SEO efforts. Click here for instructions on how to add your website to Google Search Console. You'll want to install the Keywords Everywhere extension. The Keywords Everywhere extension is a free keyword tool that can be easily installed on either Chrome or Firefox. The best part is that they show you useful information including google keyword search volume, cost per click and competition data of keywords. Watch the video to see how to install this free keyword tool. As you come up with your short list of keywords you'll want to put these in a newly created spreadsheet if possible or you can just use pen and paper. I've put together a very basic keyword research spreadsheet that you can download here. or maybe you already have a list you've accumulated. Take one keyword phrase at a time and enter it into a Google search. Look at the search results that were returned. Would it make sense for your website to be somewhere in the results? If you answered no, then that keyword phrase might not be the best choice for you to focus on at this time. If you answered yes, then jot down some information and notes into your spreadsheet. See next step. Under the search term, you should see numbers for the volume of searches per month, cost per click price, and competitiveness score. (The higher the number the more competitive a keyword is.) Put these numbers in your spreadsheet. Now, look at the other stuff you see on the page of results. Are there any paid ads? Are there any image results? Are there any video results? Are there any questions? In your spreadsheet, you can note these items and where you see them. So you'll enter ad placement like top or bottom or no if there are no ads. Lastly, make a note as to which of your website pages you think would best fit the search results you've found. Focus on optimizing one page per keyword. Now, repeat this step until you've gone through all of your keywords. 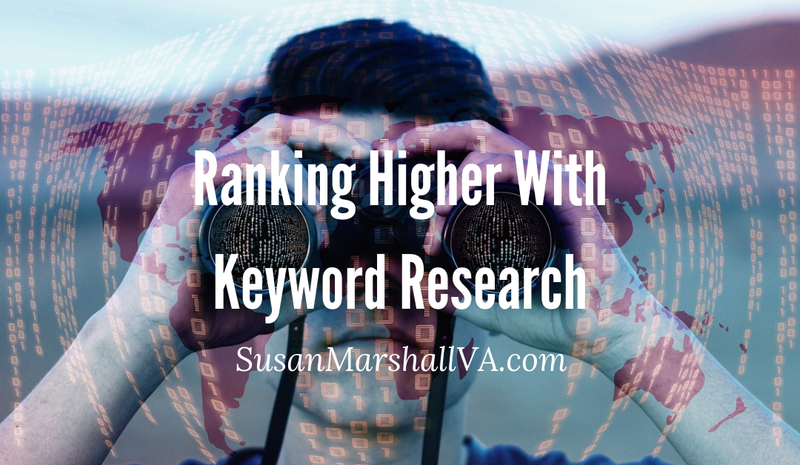 Looking at your list so far, you may note that some of your keywords are just too competitive or maybe you had to throw out some because your website wasn't as relevant to the search term as you expected. You can look at the bottom of the page where you'll find up to eight additional keywords that Google thinks are related to your original search term. Or you can find additional keywords by going to a google search and start slowly typing in relevant words. Notice as you type slowly that a dropdown list will appear and Google will start making suggestions. They're trying to guess what you're searching for. If you see any keywords that intrigue you from either of these two additional methods, click on the keyword and head back to step 2 to evaluate it further. Now you've got a list of keywords and you're ready to optimize and update your web pages. Focus on providing great content that is relevant to the search term and intent of the searcher. A good way to grasp the intent of the searcher is to have a quick look at the top 1-3 search results for each keyword. Include as much textual content as you can on your web pages and utilize headings, subheadings, and lists for people that like to skim. You'll also want to provide images and videos where it can add interest and value to your visitor. Include both links to other pages of your website and to external websites where it makes sense. Don't forget to include a call to action on your pages. What action do you want your visitor to take? After you optimize your web pages, you'll need to track and measure your results. To do this you'll use both Google Search Console and Google Analytics. As you analyze the data and rankings from both of these services you can then make more educated decisions as to what content to update and what new content to add to your website. Tracking and measuring should be reviewed weekly, monthly or quarterly depending on how much traffic you have coming to your website and how often you're adding new content. It takes time to see changes and movement so be patient. Make sure your site is connected to Google Search Console and Google Analytics. Install the Keywords Everywhere browser extension. Download or create a spreadsheet for your keyword research. Create a short list of keywords. Briefly look up each keyword in a Google Search. Document data using Keywords Everywhere extension and search results. Determine which web page to optimize for each keyword. Find more keywords if needed. Optimize your web pages for your target keywords. Track and monitor your rankings and conversions. I'm happy to answer any questions you have. You can leave them in the comments below or send me a message.